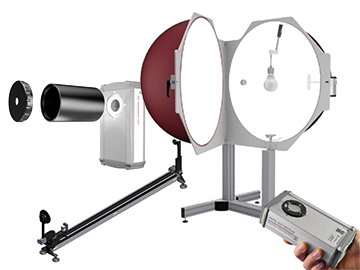 The BTS256-LED Plus Concept refers to Gigahertz-Optik's use of its BTS256-LED Spectrolightmeter as the basis for a multi-purpose tool that can be set-up with attachments for different light, color, spectral and distribution measurement geometries. The BTS256-LED in stand-alone use is designed to measure luminous flux, illuminance, color quantities and spectral distribution of PC board mounted single LEDs by means of its built-in integrating sphere with cone adapter extension. For product specifications and configurable options for the BTS256-LED Tester, please visit the Gigahertz-Optik main website here. To Order the BTS256-LED Plus Tester, Call Us Today At 1-978-462-1818. Incoming inspection needs to fully characterize individual LEDs for intensity and color temperature to ensure uniformity when the LEDs are mounted into the LED light fixtures you manufacture. You also need to perform a final QC on the finished luminaire in terms of color consistency, intensity and angular distribution. So in all you have three different measurement applications to fulfill. As a start-up the budget for measurement instrumentation is not large so cost is a big factor. Automating the final QC would be desirable to speed-up production. 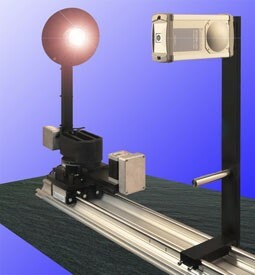 The BTS256-LED Tester plus ISD external integrating sphere and GB-GD-360-R40-2 goniometer with S-SDK-BTS256 software development kit.